I was chatting with a client recently and the topic of barricade safety came up. It’s not really an issue in running, but metal barricades can be a hazard to competitive triathletes and cyclists — especially on loop courses and criteriums that feature racing at close quarters, amplifying the risk of crashes. 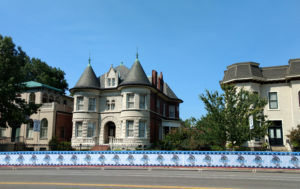 A perfectly set and branded line of fencing at the Gateway Cup Criterium in St. Louis. Few would debate the need for crowd control when fast-moving bikes are involved. The last thing a race director needs are stupid people or terrified pets dashing out in front of athletes flying along on potentially deadly weapons at 30 miles an hour. But metal barricades? Is there another sport in which boundaries of the playing field are defined by cold hard steel? Football goal posts are wrapped in layers of foam (protecting players also wrapped in layers of foam); outfield walls in baseball are padded; boxers bounce against ropes. For cycling and triathlons, there’s really no option. Viable plastic barricades are hard to come by. Anything light enough to be safe will not control restless crowds; anything capable of restraining careless spectators is bound to present a hazard to competitors. Use only barricades with flat feet, not “bridge” or raised feet. I don’t think bridge feet are acceptable even for running races, because they present a tripping hazard. In the case of bicycles, they present a significant crash hazard. This is also the reason why most plastic barricade solutions are unacceptable; the feet are too wide. If you’re using the squared-off white (sometimes orange) steel fencing, the sections should be zip-tied together so that the exposed sharp top corners of the fencing are not exposed. Tragically, a young cyclist in a criterium race in Kansas City was killed this summer when he crashed and went face-first into an exposed corner of a barricade. It was a freak accident to be sure, but if it happened once it can happen a second time. Covering your fencing with printed or unprinted boards or rolled scrim can serve to deflect riders and equipment, or at the very least prevent protruding body parts from snagging or engaging in the barricade bars. Signage can be hard or soft, but it should cover the gaps between fence sections, providing an additional layer of security. Barricade lines should be clean and continuous. The beginning of a line should be clearly marked, and probably guarded by hay bales Crossing points should be well supervised. A good-looking, well-constructed race course is not only aesthetically pleasing, it’s safer. No one solution will solve all the problems, but a sharp eye for detail will help reduce risk and minimize the potential for catastrophic accidents. As is so often the case in the event business, it’s the little things can make all the difference.